For those of you living under a rock here in Perth, Rottnest is a beautiful haven 18kms off the coast of Fremantle. Perfect for family holidays and romantic getaways, mine was the latter. Having not been to Rottnest in several years I was investigating decent accommodation. Back in the day "The Lodge" was the place to stay but according to recent reviews the newly renovated Pub was reigning supreme, trusting popular opinion I gave it a shot. From the weathered old pub it used to be, Hotel Rottnest has transformed into a modernized beer garden complete with an acoustic performer. As you walk in the entrance you are greeted with a warm, chilled vibe and a large open dining space. Making your way to the reception proved a little more difficult with poor signage although a friendly face behind the desk when you finally found it made it more welcoming. The courtyard rooms were largely unimpressive, although it boasts "premier accommodation, tastefully refurbished" it felt more like a sterile hospital room. The room was an average size with an awkward bathroom, a little shower who thought he could (but couldn't) and a fantastic view of a fence. Even the guest courtyard felt barren with a few tables, chairs and plastic grass, perhaps even some artwork would have made it feel warmer. The Hotel Rottnest restaurant almost has a cafeteria feel to it with "no table service" seeming to be a tradition on the Island. The food was palatable but not outstanding and although we were warned of a wait for our dinner it came out promptly. Had I planned further ahead it would have definitely been my preference to stay in one of the lovely Chalets or Villas scattered around Rottnest. The Villas are very basic, not overly warm in winter and don't supply bedding but they are spacious and a little out of date, in a nice familiar manner. Don't let the poor accommodation put you off though; Rottnest is a small settlement with a handful of shops and restaurants and one heck of a lot of beautiful beaches. A 4km ride to the south west of Thompson bay settlement is Salmon bay. With no one in sight I had complete privacy on this vast beach watching my partner surf and listening to music, even at times belting out a few ballads. The South West side of the Island boasts some of the best surf spots in WA. Even on the calm winter's day the waves were a good 4ft. Whinging aside, Rottnest is a beautiful Island to visit. Not only is it geographically convenient for all Perthians to visit at the drop of a hat, the beaches are unlike any other, the flora and fauna are magnificent and above all it feels safe. And who doesn't like feeling safe? 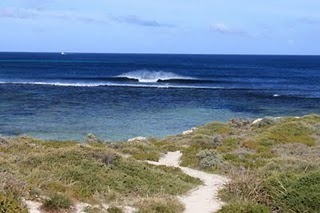 For more information on visiting Rottnest see this website.